As Forbes reported in an article about US growth in this industry, day care businesses will have some of the fastest employment growth of all industries through 2020. This is thanks to the fact that these businesses have consistently grown sales in recent years. How the industry performed during the recession is a great example of what sets childcare franchises apart from others. Businesses in this category grew sales, on average, by 6% to 7% annually between 2008 and 2012, even during the recession. Other privately held companies saw an average decline of 5% in 2009. One of the most common hesitations people have about becoming a franchise owner is the amount of capital required to do so. High startup costs and franchise fees can be seen across many industries. The good news about childcare is this doesn’t have to be a problem. This is especially true with an opportunity like investing in an All About Kids center, where the initial franchise fee and ongoing royalty fee are lower than other top childcare and daycare franchises in the region. Additionally, liquid cash requirements for an All About Kids franchise are significantly lower than other daycare and childcare franchises in the Midwest. A big part of why the franchise model has become so popular across many different industries is it provides a way for owners to get involved in different capacities. Some want to be on site each day, while others want to operate in more of a management role. But even for individuals in that type of position, they still need to be available in the event a pressing issue comes up. This isn’t always appealing with franchises that are open super early or late. Fortunately, the hours that childcare franchises operate are very conducive to a balanced lifestyle. Childcare is far from being a commodity. In fact, parents are very interested in finding a learning environment that will help their children grow socially, developmentally and academically. With a franchise opportunity like All About Kids, you get a unique but proven business model, as well as additional stand-out benefits including being among a select few green child care centers in the country. 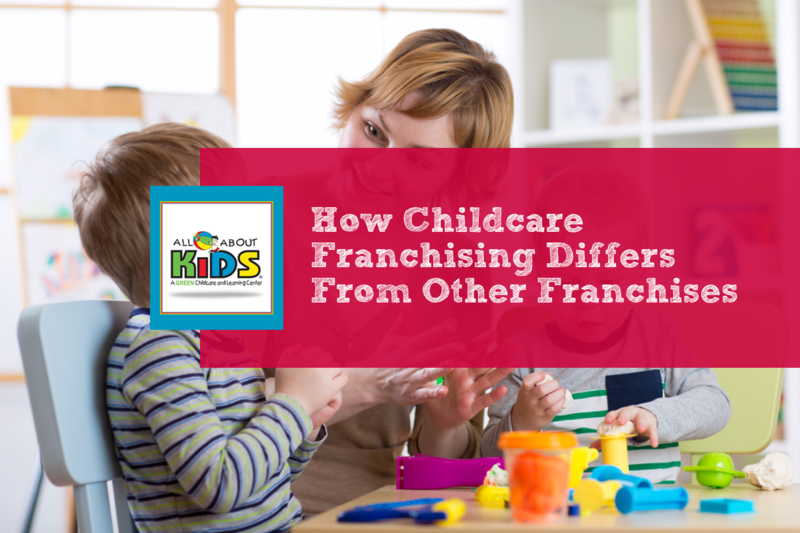 As a franchise owner in the childcare industry, you have the freedom to decide if you want to operate a single center or multiple ones. And because All About Kids is growing, our markets are not over-saturated and allow you to choose your territory. To learn even more about what franchising within the childcare industry has to offer, take a look at the All About Kids application process for becoming a franchisee.